STILL FOR SHOW—Once the show place of the early 1900’s, the TeSelle farm property on north Fruitland Mesa near Crawford stands unoccupied and weather-beaten but catching the traveler’s eye with its monstrous round red barn. 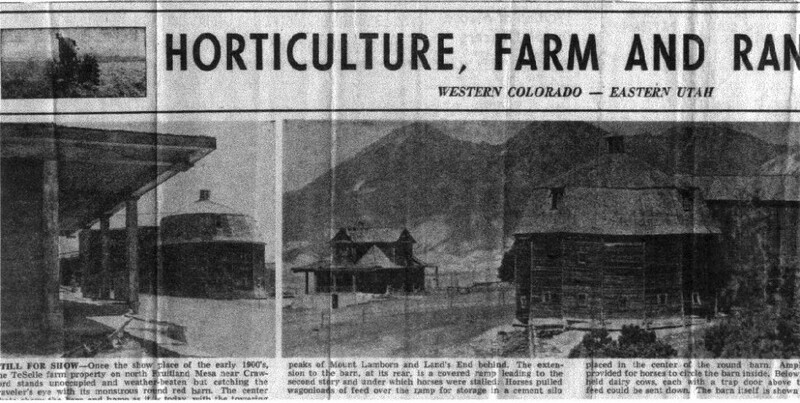 The center photo shows the home and barn as it is today with the towering peaks of Mount Lamborn and Land’s End behind. The extension to the barn, at its rear, is a covered ramp leading to the second story and under which horses were stalled. Horses pulled wagonloads of feed over the ramp for storage in a cement silo placed in the center of the round barn. Ample room was provided for horses to circle the barn inside. Below, 25 stanchions held dairy cows, each with a trap door above through which feed could be sent down. The barn itself is shown in the picture at the left, taken from one of the porches of the family home. At right is the family residence, originally a one-story building but enlarged later, as the children grew older, with four bedrooms under the gables. Daily Sentinel photos by Robert Grant. CRAWFORD – Once the show place of the country, a dilapidated and weatherbeaten mammoth red round barn and its accompanying gabled farm home now stand desolate and vacant on Fruitland Mesa as a mute testimonial to the garishness and opulence of the early 1900’s. Only a few of the old-timers in the area can remember its owner and builder, a health-seeking minister from Iowa. J. W. TeSelle, Richard and Wallace Klaseen on Fruitland Mesa recollect, was a preacher of the Dutch Reformed Church who came to Fruitland Mesa about 1907 with his family and brothers, Henry and Ben TeSelle. The Rev. TeSelle, as he was known, didn’t stay very long. He moved away about 1924 and was thought to have returned to his preaching career. J. W. TeSelle and his wife, Gertie, apparently homesteaded on the property, since the files o f the county clerk’s office at Delta show a patent deed for the property, described as “the southwest quarter of the northeast quarter of Section 13, Township 51 North, Range 8 West,” was issued by the U.S. government to Gertie TeSelle Oct. 23, 1914. Shortly after his arrival, the Rev. TeSelle began construction of the one-story frame house with four gables. As his five children grew older, Mr. TeSelle added rooms under the gables until the house had seven rooms. It was the red round barn, however, which caught the attention of the countryside. Built about 1917 of two-by-six inch boards, the massive barn had a diameter of 48 feet and was 32 feet high. A cupola topped the round barn and a huge long ramp to the second story provided easy access to the cement silo constructed inside the barn. In the dairy business, the Rev. TeSelle had a large herd of Holstein dairy cows. On the first floor of the round barn were located 25 stanchions for cows, each served by a trap door in the ceiling from which feed could be dropped into feed boxes. A cement springhouse was located at the south side of the barn for storing milk and churning butter. Under the ramp were horse stalls, with trap doors overhead, and a pig pen was located outside the barn. Once, while visiting the old Hanson ranch on Leroux Creek, the Rev. TeSelle noted that the late J. Edd Hanson was raising sunflowers for silage. Mr. TeGrotenhuis said Mr. TeSelle decided to use sunflowers for silage, but abandoned the idea a short time later. In those days, Mr. TeGrotenhuis said, the mesa was covered with cedar and sagebrush, which had to be removed before the land could be cultivated. Roads came into being as more settlers moved to the fertile mesa. The Fruitland Mesa School, boasting two teachers and about 40 students, was located on the TeSelle property. According to records in the county clerk’s office, Mrs. TeSelle deeded one and a quarter acre of land to old School Distirct 2 on Aug. 26, 1919. Foundation of the old school remains a short distance south of the barn, the building having been moved to Crawford several years ago. 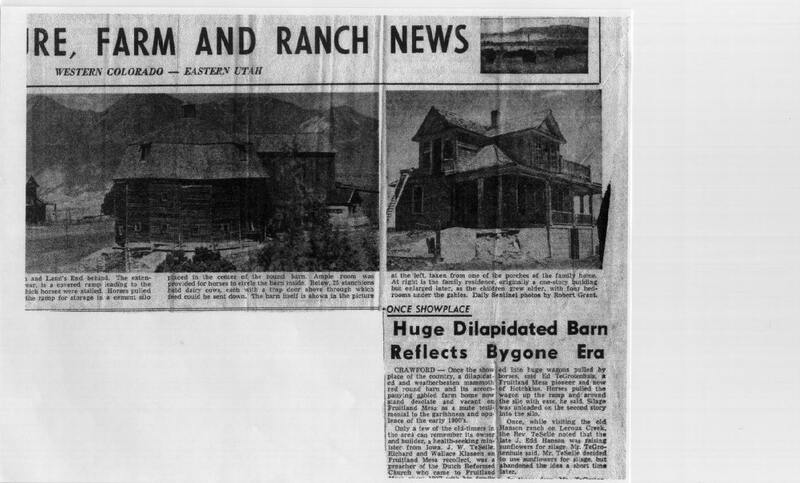 After the departure of the TeSelles, the house and barn were apparently unoccupied, but Miss Genevieve Hartig of the Delta County Abstract Co. found that a sheriff’s deed was issued to David R. C. Brown, Aug. 6, 1928. In 1944, a warranty deed was issued by Mr. Brown to William R. Horton, last occupant of the house. The property is now owned by Royden G. Girling of Lazear. The old TeSelle property can be reached from Crawford and across Fruitland Mesa or from Smith Fork Canon over Anderson Grade. The house and barn are easily seen from the road.